Our headquarters are home to exhibition halls of 40 square meters; these halls feature our products, tell the story of our company and invite you to discover the universe of the promotional item. The profusion of products that can be personalised will give you a glimpse into the objects, materials, and colours available. You will discover how the logos of various brands are revealed differently depending on the specific printing techniques and media used. You will be able to learn about trending objects, and unusual gadgets which no one can live without! With a portfolio of more than 750 clients and an average of a 1,000 products created every year, our company has amassed quite a few product samples over the years. 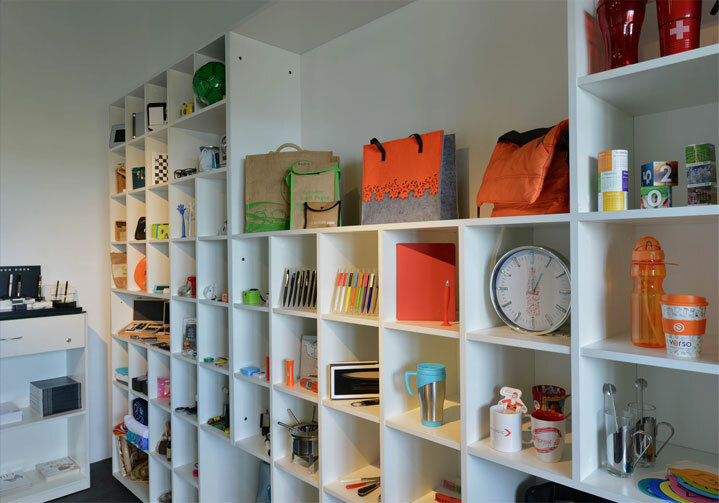 Our showroom showcases more than 500 promotional items, and is filled like Ali Baba’s cave. In search of inspiration for your next order ?